In Thailand, sky lanterns known as khom loy or khom fai are sometimes released into the sky to mark special occasions because it is believed the lanterns carry away troubles and bad luck. Khom fai usually refers to the giant paper lanterns released in the daytime during Loy Krathong which are filled with smoke to make them rise into the sky and also have firecrackers or noisy firework ‘bombs’ attached to them. Khom loy are the more general sky lanterns released at night. Traditionally, the release of these lanterns was a northern Thai tradition, but the practice has since expanded to other parts of Thailand. From the beaches of Ko Samui to the northern hills of Chiang Mai, the sight of khom loy rising against the night sky can be a beguiling spectacle. The lanterns are particularly associated with the Loy Krathong festival, but may also be seen during New Year celebrations in Thailand and at various other commemorative events during the year. Once of the most poignant use of these lanterns occurred on the first anniversary of the Indian Ocean tsunami when over 5,000 khom loy were released for each of the people who lost their lives in Thailand. The sky lanterns are usually made of sa paper or tissue paper with a bamboo support which holds the flame. Lighting the flame without setting light to the paper can be a tricky process and becomes a group activity with one person taking the role of fire-lighter whilst the others hold the lantern upright so that it doesn’t catch light. 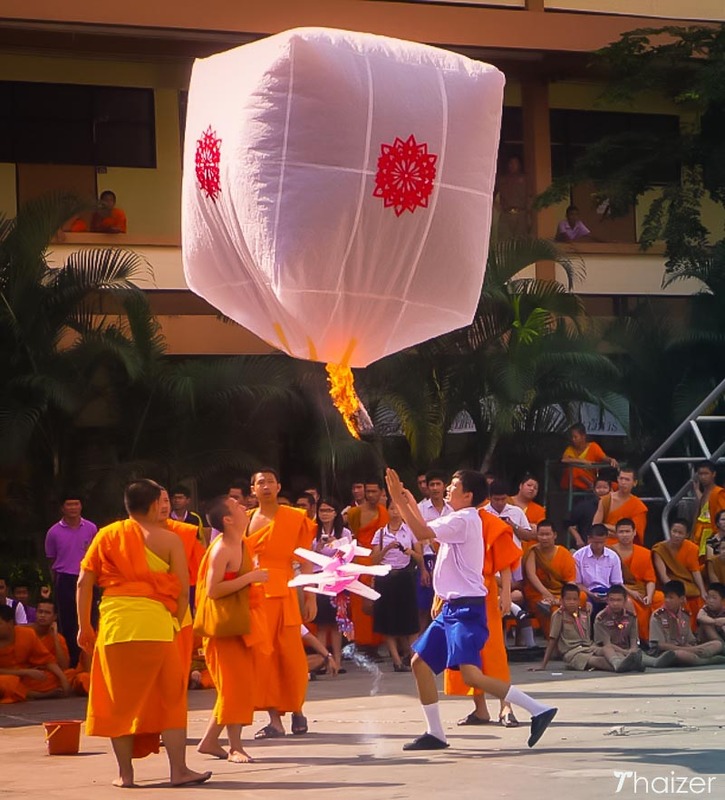 A paraffin soaked cloth may be used for the flame which then creates sufficient heat to inflate the paper lantern and provide the uplift for the ‘khom’ to be carried into the sky. Although the sight of hundreds of lanterns is beautiful, safety isn’t always the main priority in Thailand and not surprisingly there are sometimes accidents. Lanterns can get caught in trees and power cables or land on wooden buildings. 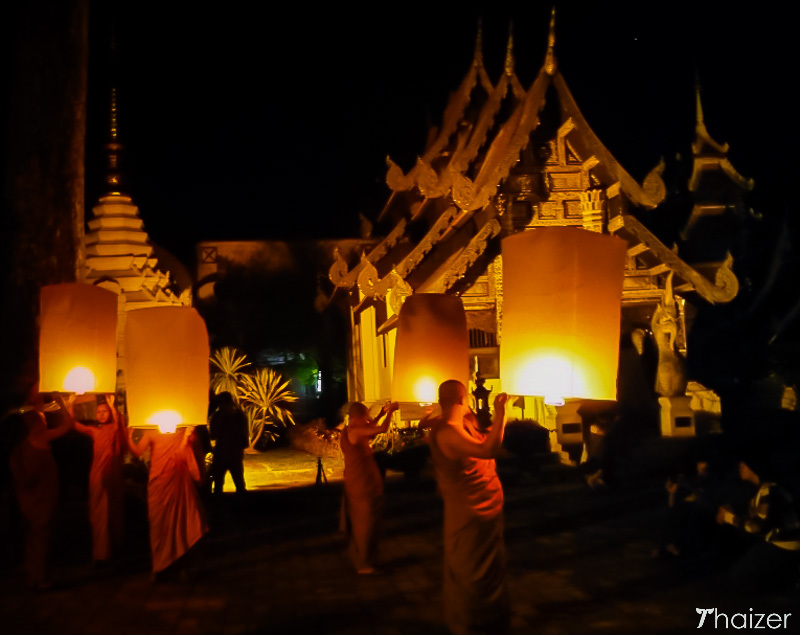 In Chiang Mai, renowned for its khom loy and khom fai, there are regulations in place which restrict the lighting of the lanterns to certain areas. Nevertheless, as This is Thailand (T.I.T.) regulations are often overlooked by some individuals.